With new Web tools, information can be released to flow in every direction (library to user, user to library, library to library, and user to user). Western Michigan University (WMU) implemented VuFind as the primary OPAC interface for its Voyager system in September 2009. VuFind includes many Web 2.0 catalog features such as user tagging, comments, and reviews, as well as “more like this” and “Did you mean?” Having relied in the past on vendors with relatively restrictive licenses and indexes, and being mindful that Voyager does not allow users to write to its database tables (i.e. to allow more community participation in describing what is in the catalog), WMU chose the open source VuFind. Originally developed at Villanova’s Falvey Memorial Library to work with Voyager; VuFind now has a community of libraries that have implemented and improved it. This chapter discusses some of the Web 2.0 services and functions that VuFind provides, and how examines how they are being used at WMU. User access logs are analyzed, and the use of tagging is examined. There was undoubtedly a significant degree of hype around VuFind a year ago, but what is the reality one year after implementation? As of 2008, WebVoyage has failed to keep pace with the state of Web development, including Web 2.0 trends toward user tagging, comments, and reviews, as well as faceted browsing, “more like this” related item exposure and “did you mean” spellchecking and suggestion. As of version 6.5.3, it also had significant usability deficiencies such as not handling initial articles in keyword searching. A pure title search for “the old man and the sea” yields no results (a “title keyword” search is required if a library wishes to allow initial articles in a way that does not result in a zero-result search). In 2008, Ex Libris released Voyager 7.0, which included a new version of WebVoyage with a more modern look and feel. WebVoyage 7 is built using different tools than version 6.5.3, and requires systems librarians to invest significant learning time to provide an interface that is not much changed from past ones insofar as it still relies on Voyager's inflexible user searching indexes. At the 2008 Ex Libris Users of North America (ELUNA) conference, the company stated a current strategy to commit resources to its Primo search and discovery product and the new Unified Resource Management (URM) concept (Rochkind, 2007). URM will affect a move from the current closed, proprietary library system environment to a new model in which Ex Libris provides Application Programming Interfaces (APIs) to its customers. While URM's data store will power link resolver, metasearch, Electronic Resource Management (ERM), and other tools, URM customers will also be able to build and modify their own applications to retrieve data from the data store. While the company will continue releasing refined versions of Voyager and its components while URM is in development, it is clear that Ex Libris sees URM as its main emphasis for future development. Some libraries are addressing the issue of problematic catalog interfaces by selecting new ILS products. Many others, including WMU Libraries, are currently monitoring strategies such as URM, and the emergence of open source catalog/library resource discovery systems and frameworks such as Evergreen (The Evergreen Community, 2008), eXtensible Catalog (University of Rochester, 2008), and the Open Library Environment (OLE) Project (2008) before deciding how to replace their current systems. 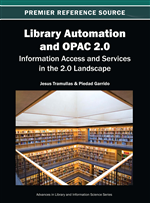 During the 2007-2008 the academic year, WMU Libraries investigated several search and discovery tools, including: OCLC's WorldCat Local, Ex Libris' Primo, Endeca, Innovative Interfaces' Encore, AquaBrowser, and Villanova's VuFind (Falvey Memorial Library, Villanova University, 2008) (Table 1). Because it does not expose local MARC data, WMU decided against WorldCat Local. Primo was also rejected partly because it refers users to Voyager's WebVoyage-presented detailed record display, and partly because WMU did not have a federated search tool in place (Primo leverages federated search to combine catalog and database search results in a single set). Endeca, Encore, and AquaBrowser are each relatively expensive.